It is challenging to narrow down the selection of treadmills, especially if all you have to go on is a list of features on a website. One that looks great on paper could vibrate or have a running surface a bit too short for your stride. If the Weslo Cadence R 5.2 Treadmill is on your comparison list you will appreciate that it offers a few very thoughtful features at an affordable price. The Weslo Cadence R 5.2 treadmill is a solid mid-range treadmill with several well though-out features. How Does the Weslo Cadence R 5.2 Work? The first thing you will notice and instantly appreciate about this unit is how solid it feels, even at higher speeds. It has a sturdy frame, and the 50″ belt is more than long enough for the average jogger. If you enjoy mixing a few sprints into your run you may feel short on space though, if your stride typically lengthens. The Weslo Cadence R 5.2 boasts Comfort Cell Cushioning. This absorbs impact, thereby placing less strain on your joints. It features a Workout Matrix Display that is tinted blue, which is nice, if you are using it in a poorly lit spare room, basement, or garage. This display lets you track your time, distance, speed, calories burned, pulse, and resistance. It can even generate a graphical representation of your workout for you. Although you are welcome to create your own workout, you might enjoy trying some of the workouts pre-programmed into the system from time-to-time. The Weslo Cadence R 2.5 Treadmill will operate at speeds up to 10 mph, and offers two adjustable incline options. However, it is naturally at a very slight incline that you may wish flatted out a bit on days you are dragging a little during your warm up. 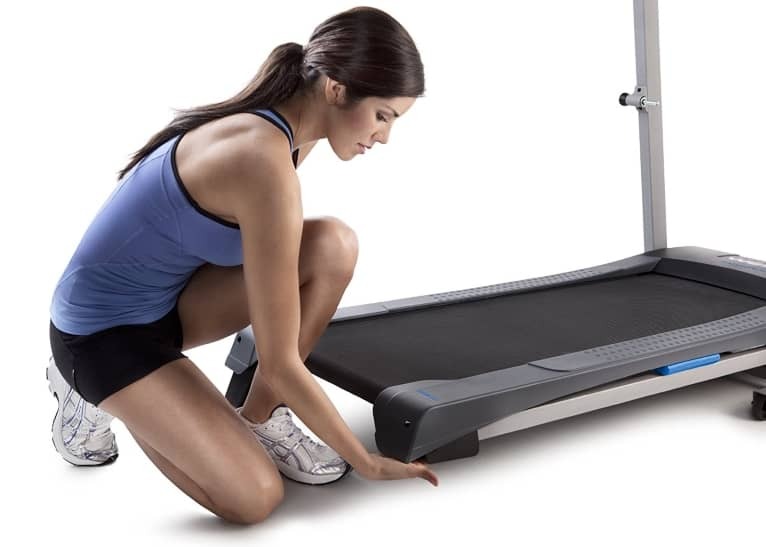 Do not let the fear of assembly hold you back from buying this treadmill. It is mostly put together when you remove it from the box, and can typically be finished off in under an hour. When not in use, its SpaceSaver Design allows you to quickly tuck it away with minimal effort. What Are the Health Benefits of Using the Weslo Cadence R 2.5? Whether you prefer to walk, jog, or exert all your energy into a full-force run, you will receive health benefits at any pace. Cardiovascular activity is good for you in more ways that you can imagine. Not to mention, physical activity releases endorphins, which improves your mood. Since this unit does feature Comfort Cell Cushioning, those who generally suffer from a sore back or joint pain can get in their daily miles in a more comfortable way. The adjustable incline will work your muscles and cardiovascular system harder, thereby maximizing results. Plus, the preset workouts will keep you from getting bored. Also, you burn more calories and see greater body transformation when you have a bit of a variety in your routine. Speeding up and slowing down, and transitioning between inclines makes for a far better workout than running at the same pace for an extended period of time. You do not always have to mix things up, but it is nice to have the option. SpaceSaver Design allows it to be folded and tucked away. Two-position adjustable incline increases workout intensity for faster results. 2.25 HP Impulse Motor delivers consistent operation. Comfort Cell Cushioning absorbs impact. Workout Matrix Display has a blue tint to make it easy to read. Display is capable of creating a graph to represent your workout. Six workout apps give you variety. 0 to 10 mph QuickSpeed Control lets you change speed with a touch of a button. 16″ x 50″ treadbelt is fairly roomy. Backed by a 90-day warranty covering motor, labor, and parts. You could go to a local sporting goods retailer and try to find it, and deal with hauling it home and carrying it in the house, or you can do yourself a favor and just order it from Amazon. Sure, it is available at other online retailers, but Amazon is respected around the world for its secure shopping experience and incomparable customer service. Plus, list price on this treadmill is $499, but Amazon offers it for only $299, and throws in free shipping. The Weslo Cadence R 2.5 is a recommended pick, if you do a lot of walking or light jogging. Those who run hard may get irritated over the noisy motor. So, although it does a good job of staying composed at higher speeds, you will need to turn the television up full blast. Not to mention, the 50″ deck will be a little short for a runner with a longer stride. The fact that the deck does not completely flatten may be a swing vote for some people, too. If you are on a tight budget, then this is definitely a treadmill worthy of consideration, as it does have a lot of features you would not expect to find at such a modest price. Reading reviews is an essential step in making a major purchase. They allow you to learn how consumers just like you feel about a product, and whether it delivers as promised. You can read more about this treadmill and read through countless reviews right on Amazon.